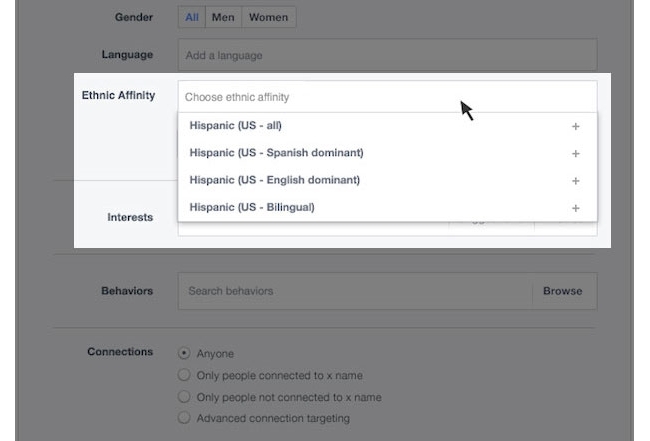 Facebook added three language preferences to its ad-targeting options for brands marketing to U.S. Hispanics: Spanish-dominant, bilingual, and English-dominant. The new language preferences are an extension of the U.S. Hispanic affinity segment the social network introduced last year, and they are currently available to marketers via Facebook’s ads interfaces and its ads application-programming interface. Last year, we introduced the U.S. Hispanic affinity segment, giving marketers the ability to reach more than 23 million people in the U.S. interested in Hispanic content. Today we’re making it easier for advertisers with Hispanic marketing efforts in the U.S. to deliver more relevant messages — in the languages that matter to their audiences. These new language-based targeting segments allow marketers to tailor messages to people in the U.S. Hispanic affinity audience based on three language preferences: Spanish-dominant, bilingual, and English-dominant. We’ve seen in early tests that segments based on language preferences can help marketers create more effective campaigns. Working with a national CPG (consumer packaged goods) brand, we tested three Spanish and three English posts against each language segment over a six-week period. The company was able to reach 2.8 million women between the ages of 25 and 49, delivering 99 percent of impressions on mobile. Compared to its general marketing efforts, the Spanish-dominant and bilingual targets helped the company see up to 40 percent increases in engagement. Like other targeting capabilities offered through Facebook, the U.S. Hispanic affinity audience is designed to protect people’s privacy. Marketers can reach specific groups of people without the need for Facebook to share which specific people are in those groups. As of today, the language-based targeting segments are available to U.S. marketers via our ads interfaces and API. To try them out, look under More Demographics → Ethnic Affinity. Then select your segment. Readers: How can brands take advantage of the three new language preferences introduced by Facebook? Image of Hispanic women with mobile phone courtesy of Shutterstock.